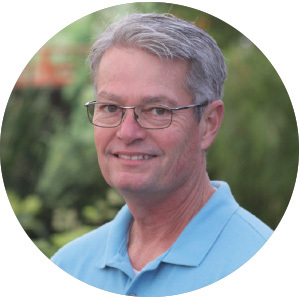 I was born and raised in Southern California, and my entire 33-year career in the horticulture industry has been in large-scale nursery production management. After attending Fullerton Community College I graduated with an A.S. degree in ornamental horticulture, and completed my education at Cal Poly Pomona with a B.S. degree in ornamental horticulture. I feel fortunate to have worked for Monrovia at all three West Coast operations. My first position was in Azusa, California, where I was hired as the assistant propagation manager. I then transferred to the Visalia, California to become the grower of specialty plants, helping in the development of the newly established nursery. Currently, I’m in the Dayton, Oregon location where I am the nursery grower manager. When I’m with other members, I talk about how I really want to stimulate getting people to attend meetings and be a part of the association. I encourage us all to try new things, different approaches, and to show people about the importance of networking and bringing people together. I want to work with horticultural craftsmen to grow the highest quality plants. I like to help develop new processes and technology to grow plants more effectively. What’s the best business decision you’ve ever made? My relocation to Oregon was a smart move. I learned how to grow plants in the beautiful Pacific Northwest environment. What’s the hardest business decision you’ve ever made? For me personally, working through the recession of 2009 was hard. We had to make heartbreaking decisions to downsize inventory and reduce labor, and it was very challenging. Who is your most significant mentor? I have had many mentors my horticultural career. The one who stands out is Bruce Usrey. He taught me many ways on how to be a successful grower and to always treat your employees fairly and with respect. One doesn’t have to be afraid of change because change is good. He taught me to keep your growing clean, weed free, organized and most importantly: keep your plants in straight lines. Whenever your assembling plants for orders or canning stock, they must be assembled in a uniform order. Those are just a few things that Bruce taught me. What is a goal you have yet to achieve? I look forward to completing my first year as nursery grower manager. I think I work well with the craftsmen and other nursery staff. Building up my managers to operate at the best of our operation’s abilities is something I think suits my expertise. I like to mentor them and try to push for them to make their own decisions. What is your best business advice? I tell people to focus on best business practices, seek opportunities for continuous improvement and adjust to changes in the industry. Most recently, working with the labor shortage is a challenge with the high turnover rates and the quality of labor. This is a great learning experience on how to prioritize your work. I have a love of plants and the opportunity to grow them. I have a passion for planning and having plants ready on time for our customers. Watching your plants being assembled and shipped is what it’s all about. What do you love most about the nursery industry? It’s great to have the daily opportunity to produce plants that enhance landscapes and are beneficial to the environment. I also feel I’m fortunate to work for a company where I’m able to seek and introduce new plant varieties to the nursery industry. I received the Young Nurseryman of the Year award in 2001 from the California Association of Nurseries and Garden Centers (previously known as California Association of Nurserymen). I was heavily involved with the CAN when I was in at Monrovia’s Visalia, California nursery, where I was on different committees in many ways. I served as a chapter president for two terms, and also the state director for the San Joaquin chapter. In your opinion, what are the most critical challenges facing the nursery industry today? There are many. The challenge of finding, training, and retaining labor is tough. The continuous rise of minimum wage compresses hourly rates, and it is expensive to invest in automation to make our industry more ergonomically friendly. Lastly, it’s critical for the nursery industry to promote itself as a great career option to young professionals.